Juan Andrés Maya grants an emotional and generous interview with Cardamomo Flamenco Show Madrid, in a period in which the flamenco Tablao is being enriched by artists coming from all over Spain, with new stage proposals, without abandoning the purity that has always characterized it. 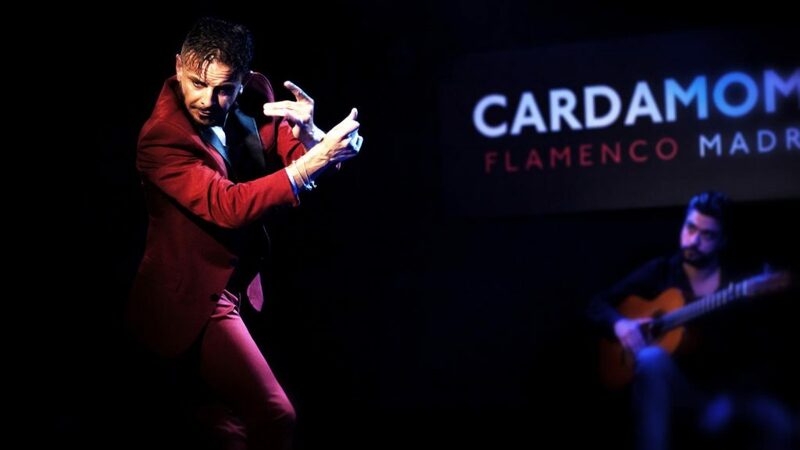 From humility and heart, he lets loose in front the camera describing the indescribable, the magic of his dance, sharing his perspective on the place that currently occupies the Flamenco in the society. He’ll be dancing in Cardamomo, except on thursday, march 28th. Actually, the dancer has at his back a professional career recognized worldwide. His professional career does not stop growing, but his never forget his origin. Juan Andrés Maya was born in 1972 in the emblematic Granada district of Sacromonte, surrounded by an authentic saga of artists, his family and friends. It starts to dance almost at the same time as to walk, and quickly becomes the focus of attention of the cave La Rocío, the family business Gypsy where many people of people come to know Flamenco. He has recently participated in a TV program Gipsy Kings with his family, under the nickname “Los Reyes del Sacromonte”, providing a vision on the gypsy people hitherto unknown. In this interview, the dancer talks about the consequences and impressions of this experience, with which they have received flattery and criticism everywhere. Juan Andrés Maya acts as a special show in the Flamenco Tablao Cardamomo, performing a magnificent and poignant dance. Is it still flamenco if it fuses with other genres? That was what interested me. I’ve seen a lot of contemporary, which I love. I’ve done eight years of Spanish classic. I want to be different, I do not like to look like anyone else. And I respect all my colleagues. I am a gypsy, I am flamenco and I come fromthe Mayas. But not because I’m a gypsy, nor because I’m flamenco, I have to have those characteristics. Because inside my dance I put many contemporary things, I put many classic brushstrokes. I do not know if they are dancing soleá, seguiriyas … An explosive mixture! not come as a worker who hammers nails, but … We are not every day the same. goblins are in the air, under the rocks. I don’t know… The goblin is something very difficult, it is there, but it isn’t there. The most important thing in dance is to know how to wait. Bocaillos, or Laura Abadía, El Cancu … They all sing like angels! Please! How is the relationship with your students? give a person a chance, even if they don’t have the financial means, I feel proud. thing I have given to them, I would like them to keep it. That air, that smell. The beautiful is, the worse, the better … With your own stamp! there are people who dance very well. Since I was little I liked dancing. I have been raised in the Maya family, I am a Maya. they talked about … To soak up what Flamenco was. other me that comes out real.